Canola growers Doc Fetherstonhaugh and his brother, Barn, look for expert advice to help them manage market fluctuations and ensure profitability on their WA farm. The brothers have been in business since 1986 and growing canola since 1992. Together with their wives, Bernadette and Cate, they run Fetherstonhaugh Partners at Munglinup, 120 km west of Esperance in Western Australia. On average, they sow 1,700 hectares of canola and 1,700 hectares of wheat or barley a year using their Case IH MX270 tractors. “Our marketing specialist, Chris Tonkin, sits down with Barn and me at the start of the season to discuss our selling strategy. Generally speaking, we plan to forward sell a proportion of the canola at the start of the season when the prices are right. Then, as the season progresses Chris keeps an eye on the market and advises us on key times to forward sell - generally when market prices are peaking,” Doc said. This year, Doc and Barn sold 250 tonnes of canola at the start of the season, when prices were fluctuating between $700 and $800 per tonne. Their plan was to wait until prices rose to around $750 per tonne before forward selling any more of their crop. As part of their farming strategy, the brothers run all of their equipment, including the Case IH MX270 tractors, a Patriot 4420 sprayer and an Axial-Flow 8010 combine, on 3 m wheel spacings. 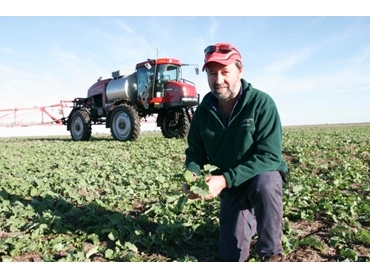 “Tramlining at 3m spacing helps us to manage compaction significantly,” Doc said.